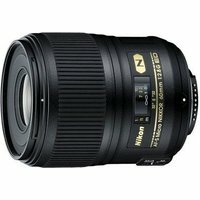 The Nikon AF-S Micro-Nikkor 60mm f/2.8G ED Macro Lens provides an exceptional range of applications and high-quality performance. It is compact and versatile, this lens is perfect for close-up, copy and general photography. Its Close-Range Correction (CRC) system guarantees high resolution from infinity to close-ups down to 7.3", with a 1:1 reproduction ratio. The 60mm Micro lens features ED (Extra-low Dispersion) glass elements that provide superior optical performance. The SWM (Silent Wave Motor) and IF (Internal Focusing) features ensure fast and quiet focusing action, and the nine-blade rounded diaphragm makes out-of-focus elements blend smoothly to produce natural-looking, harmonious backgrounds.